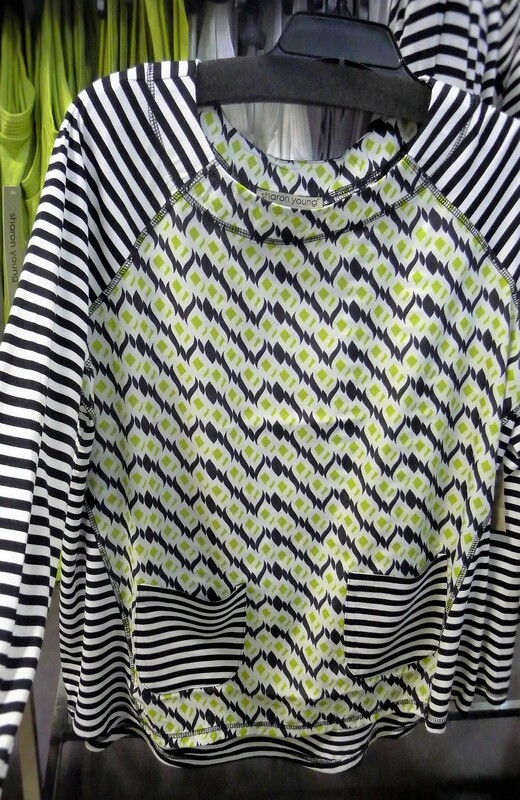 The Sharon Young & Ladies Designer Brand Warehouse clothing sale is almost here! Our readers’ favorite fashion sale only opens its doors four times a year, and the long-awaited 3-day summer sale starts on Thursday (July 28-30)! The sale will be huge with over 18,000 pieces starting at $20 with sizes to fit just about anyone ~ from petite to women’s plus sizes and everything in between (sizes 2-18 and a stylish selection of 0X-3X). We just got back from a preview shopping trip, saved a bundle (50 to 75% off regular retail! 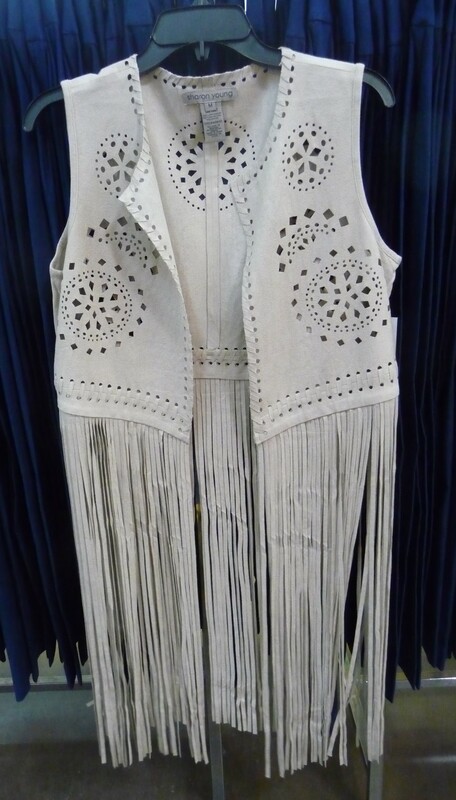 ), and went home with some gorgeous clothes usually only found at higher end ladies boutiques and department stores at higher prices. 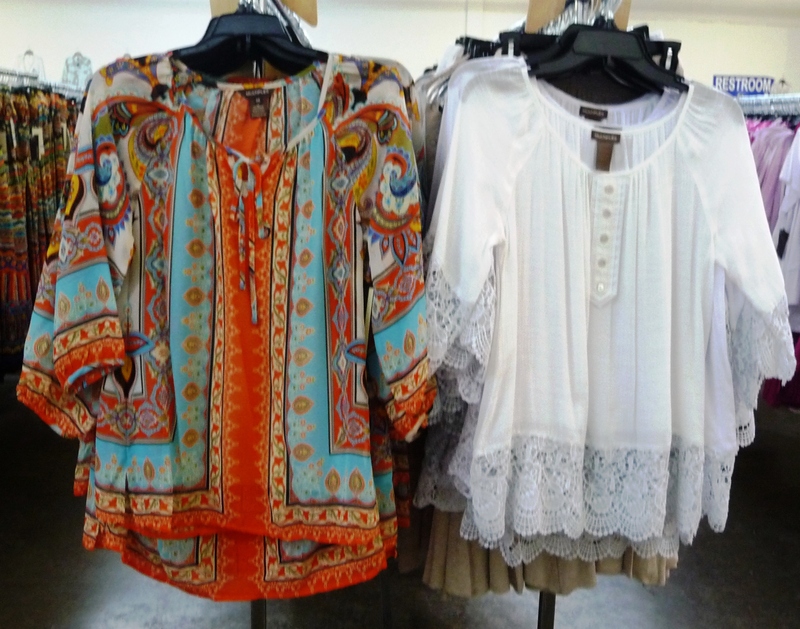 The racks were already packed, and even more beautiful pieces were coming into the warehouse during our visit! 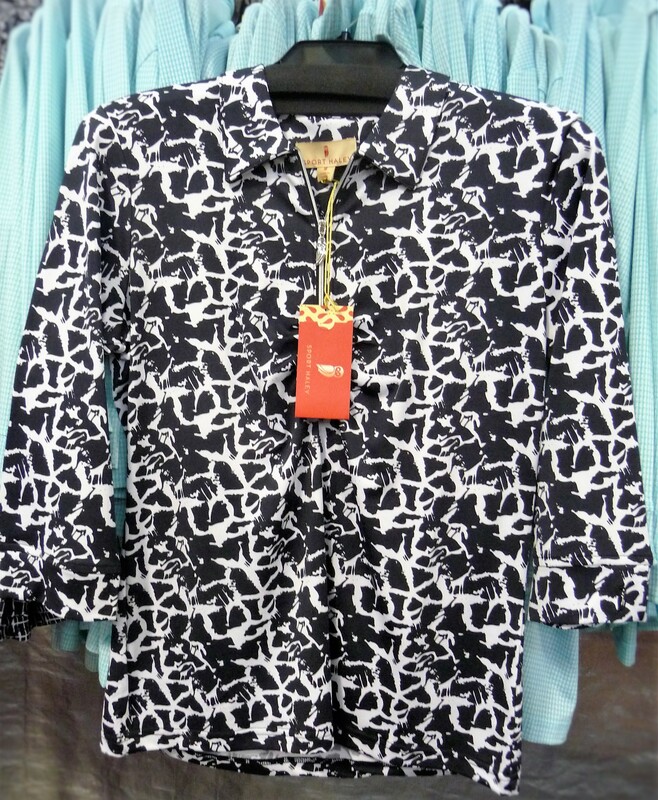 The sale covers a huge selection and variety of styles and sizes, from trendy to traditional and from “running to the grocery store” casual to night-on-the-town dressy. 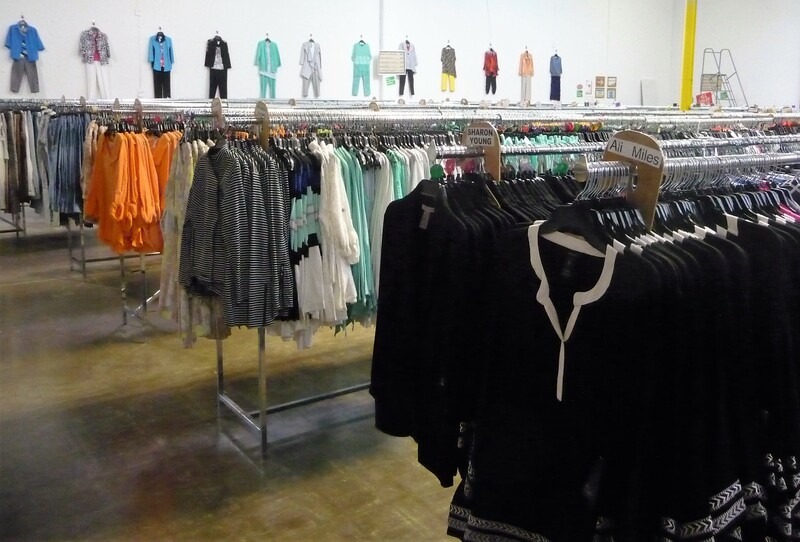 You’ll find everything you need to complete an outfit including tops, skirts, pants, and jackets ~ all $20 to $60. 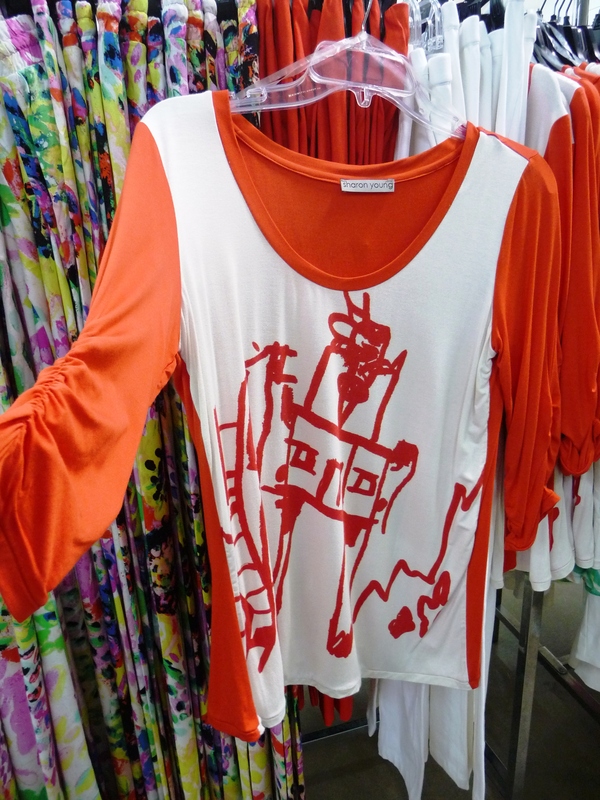 And, even though the sale is huge, everything is very organized into collections, making it easy to navigate the sale. 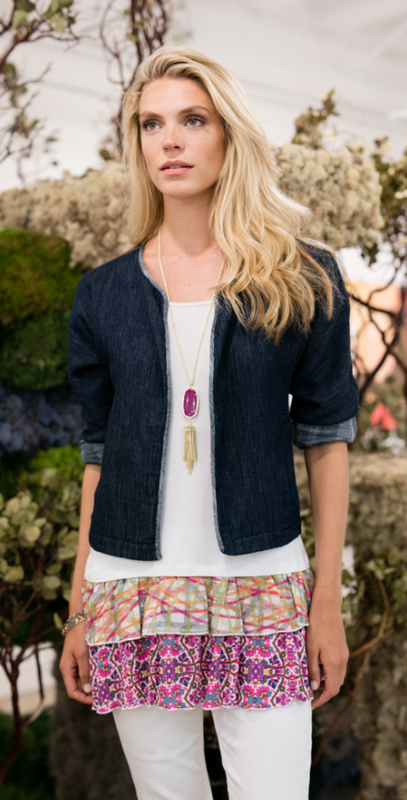 Brands you’ll see include the new high-end boutique John Mark line (most John Mark pieces are at least 60% off! 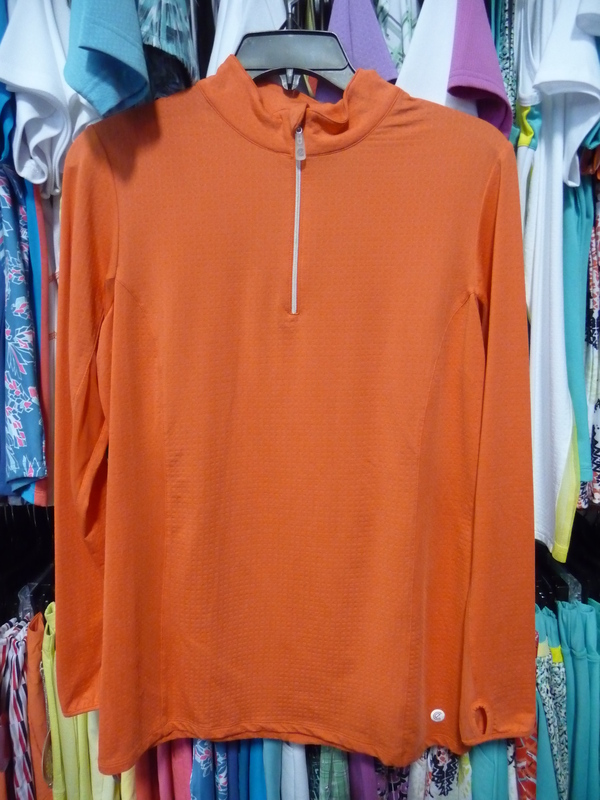 ), Sharon Young, Multiples, Tru Luxe jeans and tops, Ali Miles, Slim-Sations, A La Carte, the new Bette & Court and Sport Haley luxury golf brands, and more. Psssssst… Slim-Sation is the same line of pants carried by a high-end travel clothing/online catalog store for almost TWICE as much as you’ll find them at this sale. 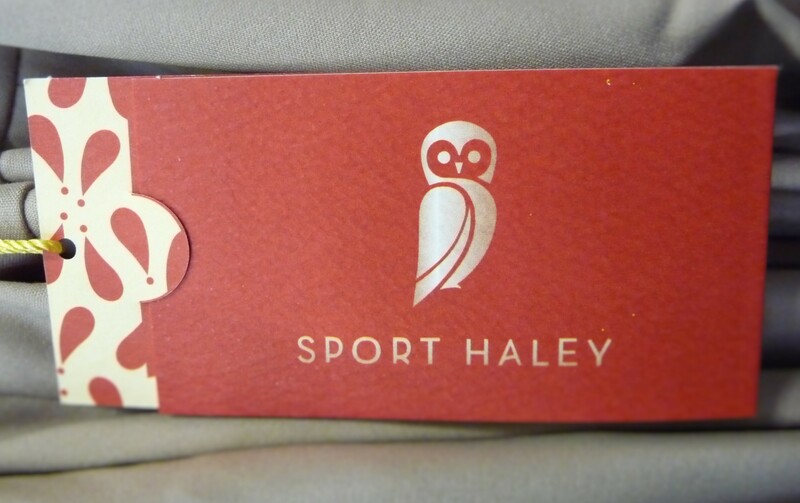 We can’t reveal the name of the store, but doing a little Google search might tell you (wink-wink). Slim-Sation pants have a little inside tummy smoothing panel that make you look a size smaller ~ our “go to” favorites for comfort and fit. INSIDERS TIP: Take advantage of a special “Buy One Get One FREE” deal on Thursday and Friday (only)! This offer is on top of the already discounted prices, so be sure to ask about this deal to stretch your savings and wardrobe. 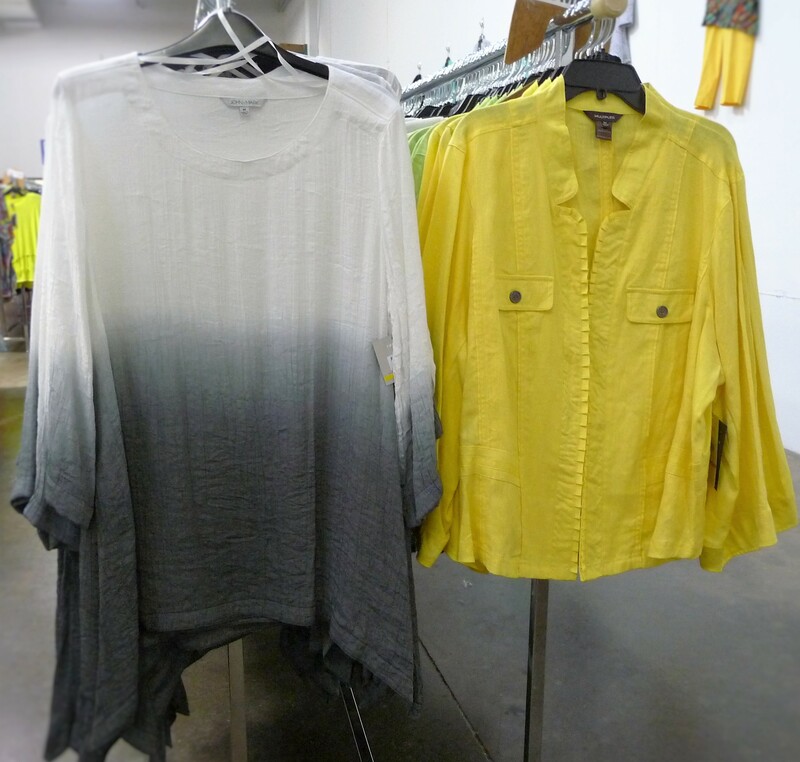 We had a great time previewing the warehouse sale for you! I hope you are able to make it over to the sale to check it out yourself and grab some bargains, too. 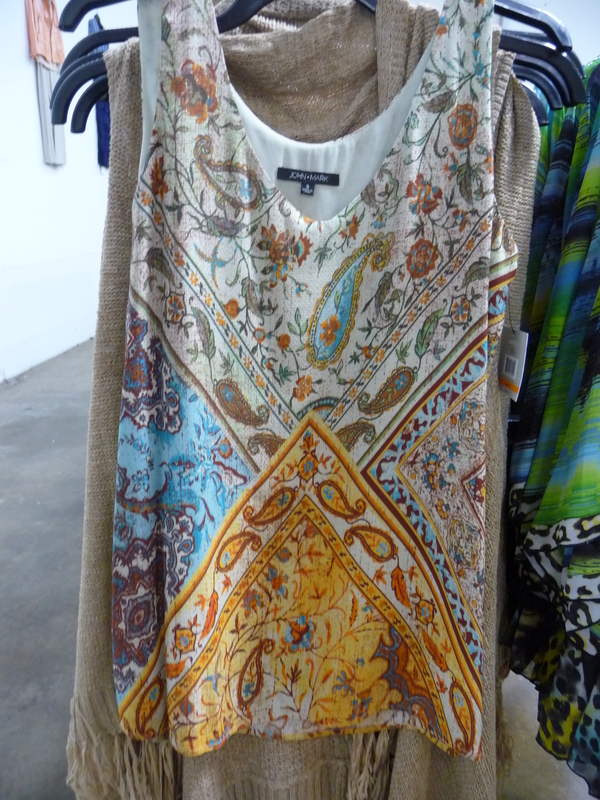 As promised, we hopped over to Dallas to bring you an exclusive preview of the Ladies Designer Brand Warehouse Sale. The sale opens its doors for just 3 days to the public, and it starts this Thursday (runs April 28-30). 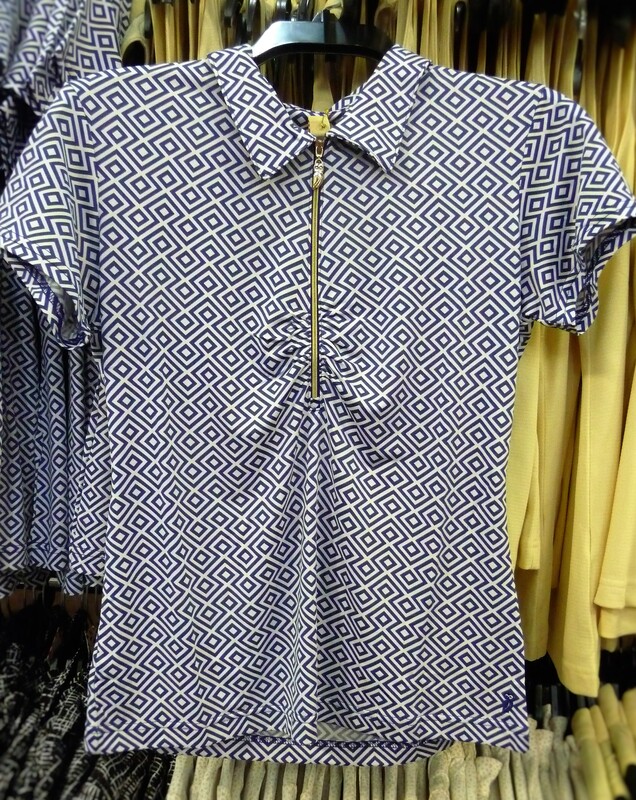 We had so much fun on our preview trip and found so many goodies that it was hard to choose! 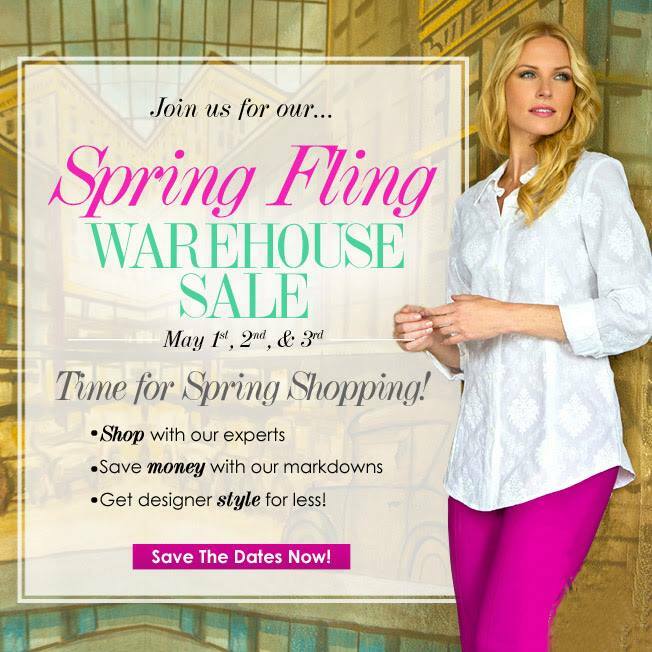 The Ladies Designer Brand Warehouse Sale only opens its doors four times a year, and this long-awaited 3-day Spring fashion sale starts this Thursday! 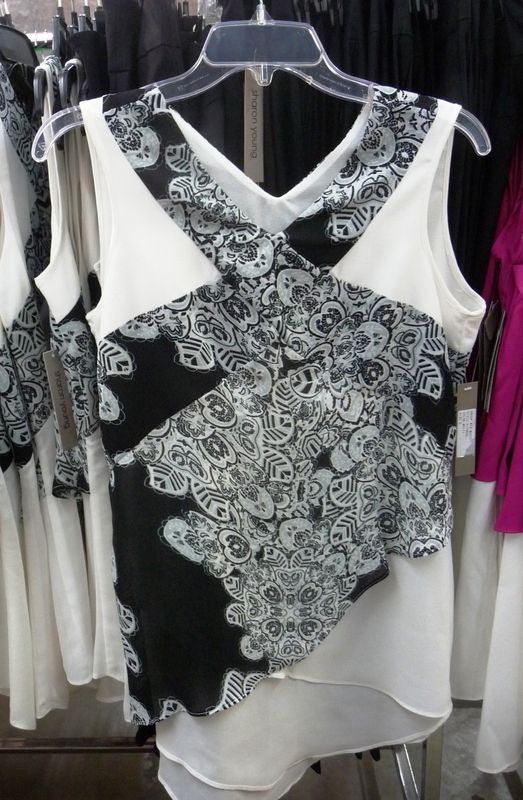 This sale is huge with over 22,000 items, like the beautiful, silky Ali Miles sleeveless top pictured above — over 70% OFF retail at only $20! 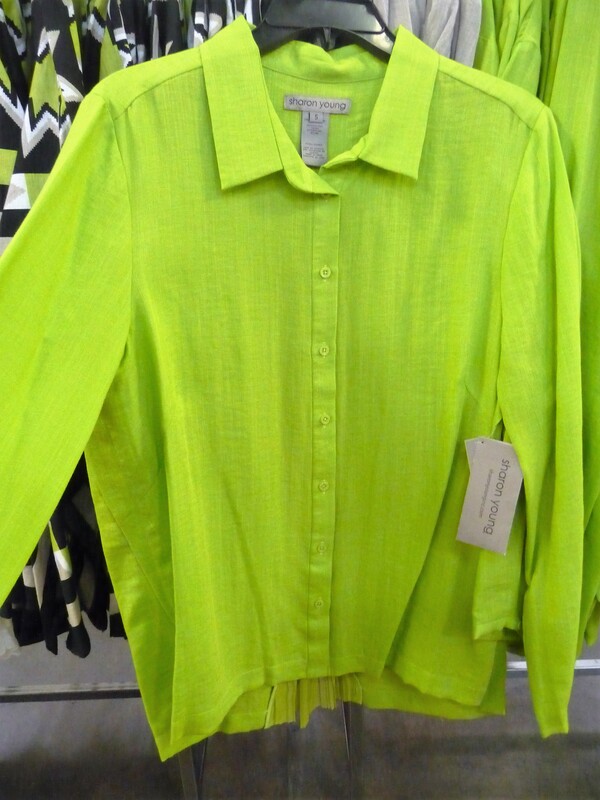 We happened to see this exact top on display at a major department store last weekend for $69 — we cannot say where, but a little Google search for “Ali Miles” might tell you, wink-wink :). 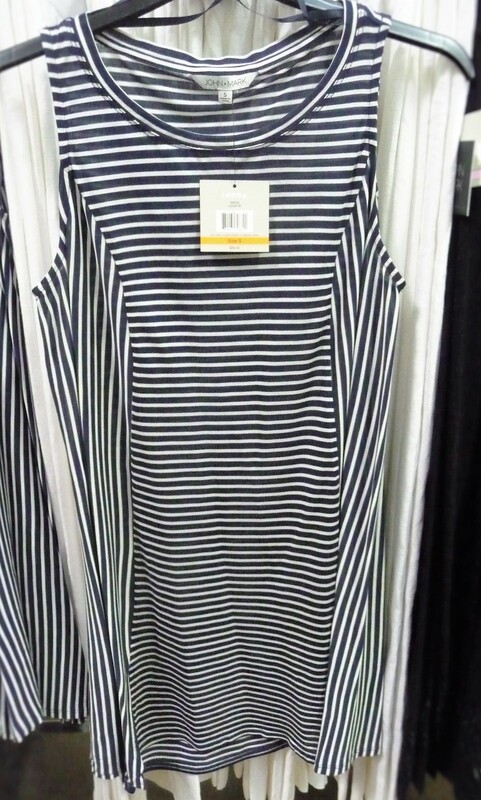 Once again, I saved a bundle (50 to 75% off regular retail) on some wonderful new pieces for my wardrobe and went home with some gorgeous clothes usually only found at higher end ladies boutiques and department stores at MUCH higher prices. 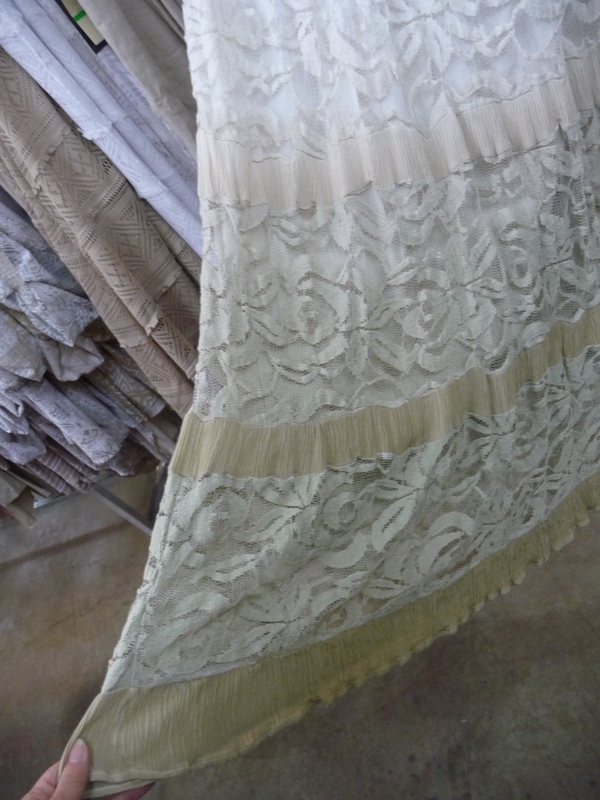 The racks were already packed, and even more beautiful pieces were coming into the warehouse during our visit! INSIDERS’ TIP: The sale will feature a special “Buy One Get One FREE” deal on Thursday and Friday (only)! This offer is on top of the already discounted prices, so be sure to ask about this deal to stretch your savings and wardrobe. 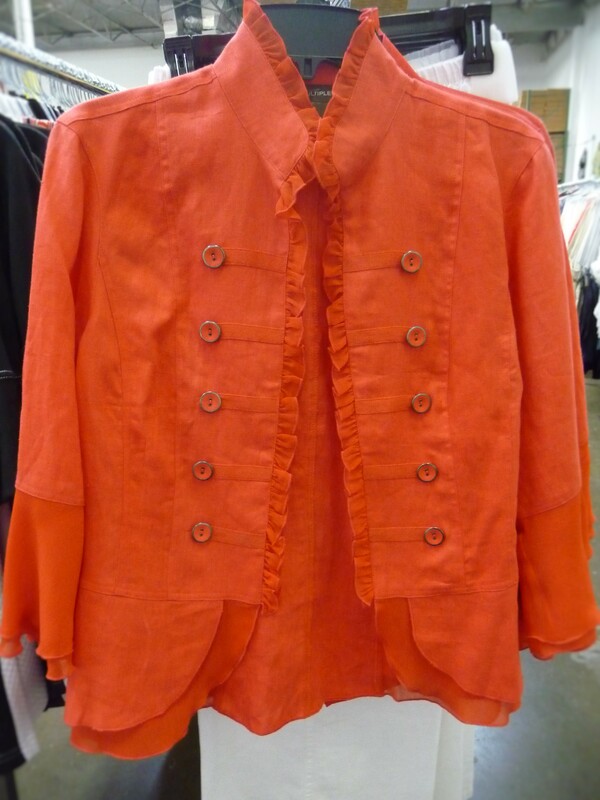 You’ll find everything you need to complete an outfit including tops, skirts, pants, and jackets ~ all $20 to $60. 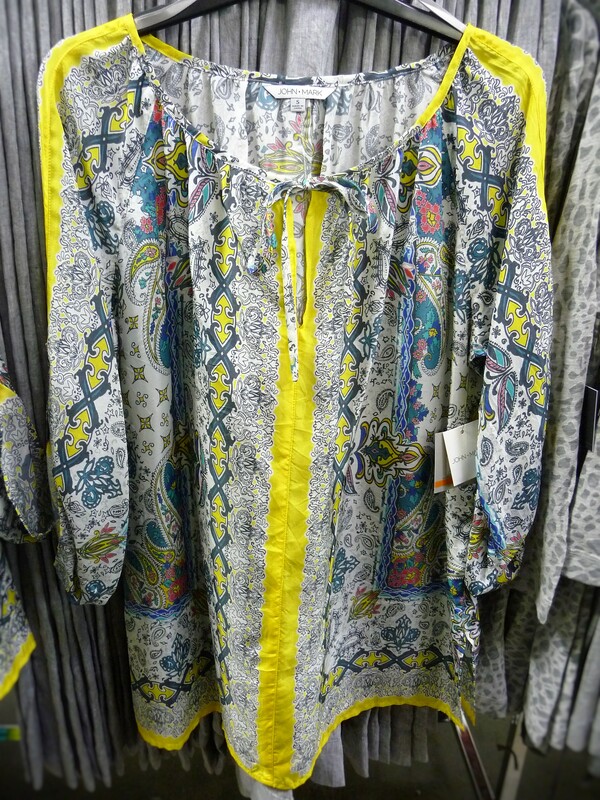 And, even though the sale is huge, everything is very organized into collections, making it easy to navigate the sale. 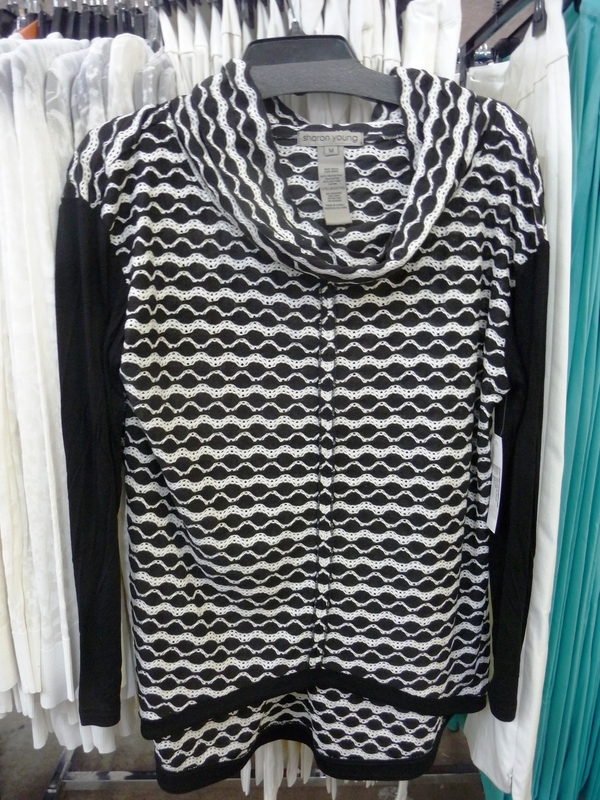 Brands you’ll see include the new high-end boutique John Mark line (most John Mark pieces are at least 60% off! 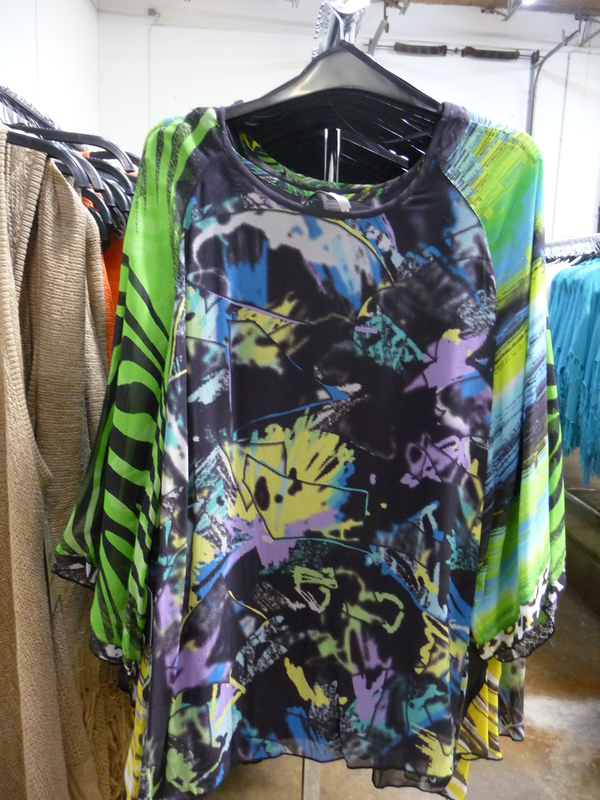 ), Sharon Young, Multiples, Tru Luxe jeans and tops, Ali Miles, Slim-Sations, A La Carte & more. The sale covers a huge selection and variety of styles, from trendy to traditional and from “running to the grocery store” casual to night-on-the-town dressy. 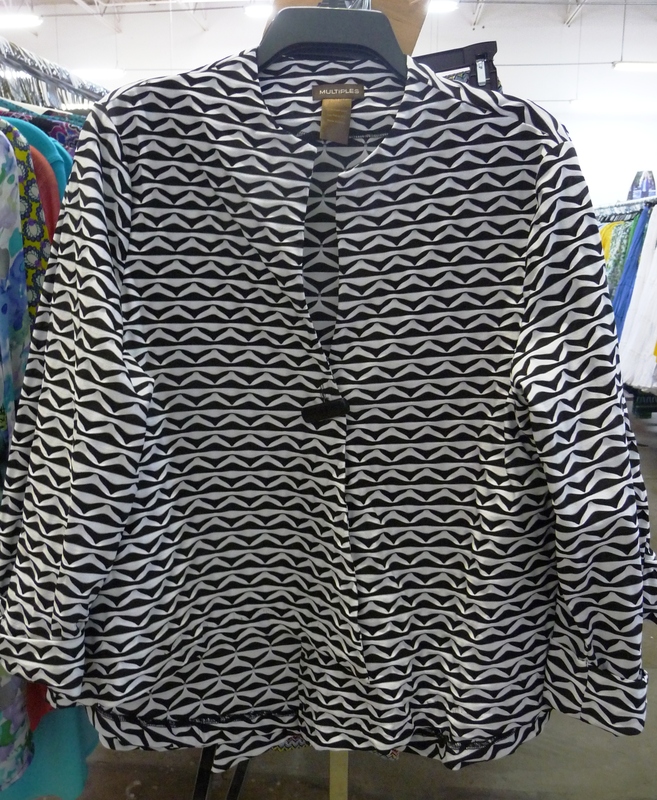 Plus, we found a nice variety of sizes to fit and flatter just about anyone ~ from petite to women’s plus sizes and everything in between (sizes 2-18 and a stylish selection of 0X-3X). :: We fell in love with the lovely fabrics and careful attention to quality and details we found in the new “John Mark” collection — incredible bargains with most over 70% off retail! 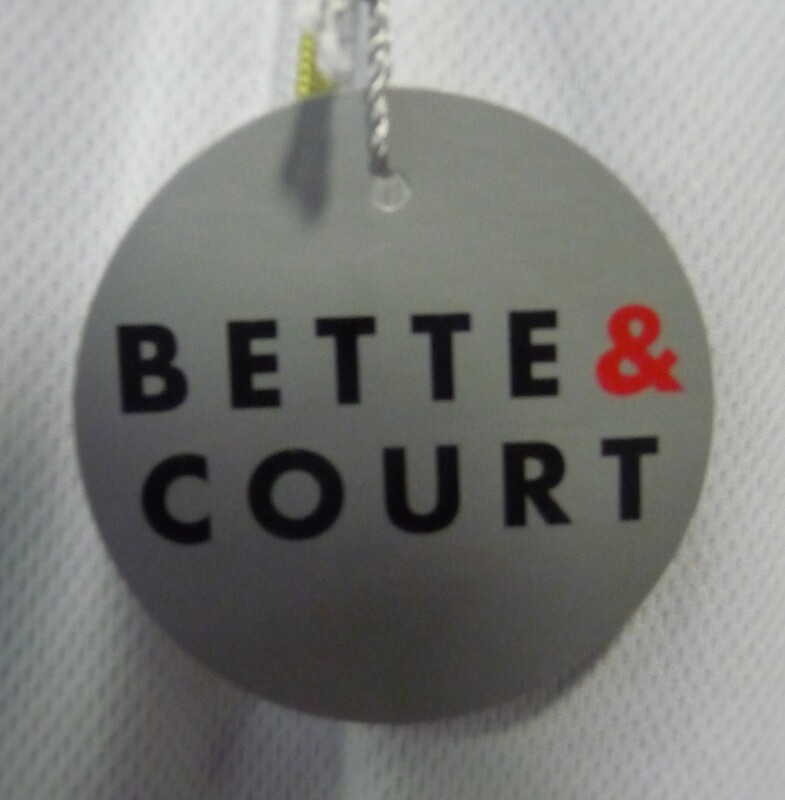 Be sure and look for this high-end, boutique quality line (definitely a “Best Buy” at this sale). :: There are thousands of beautiful tops and pants throughout the sale with prices starting at $20 (like the Sharon Young sleeveless graphic top on the right for $20). 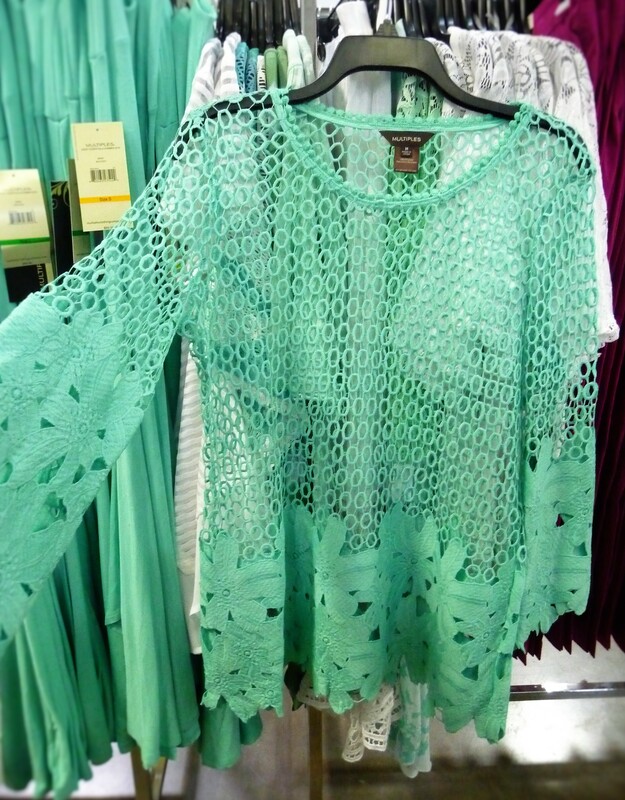 :: We found lots of on-trend lace layering pieces that add a breezy accent to a favorite pair of jeans or pants. 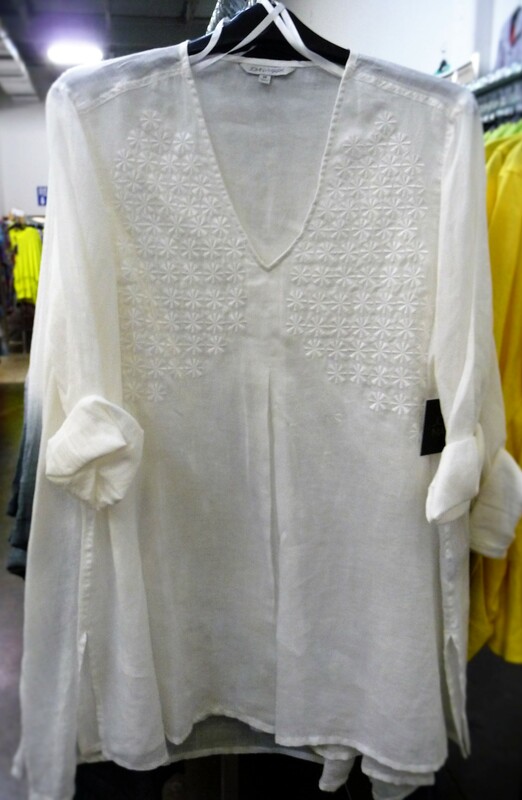 :: We even found this wardrobe making REVERSIBLE John Mark blouse! 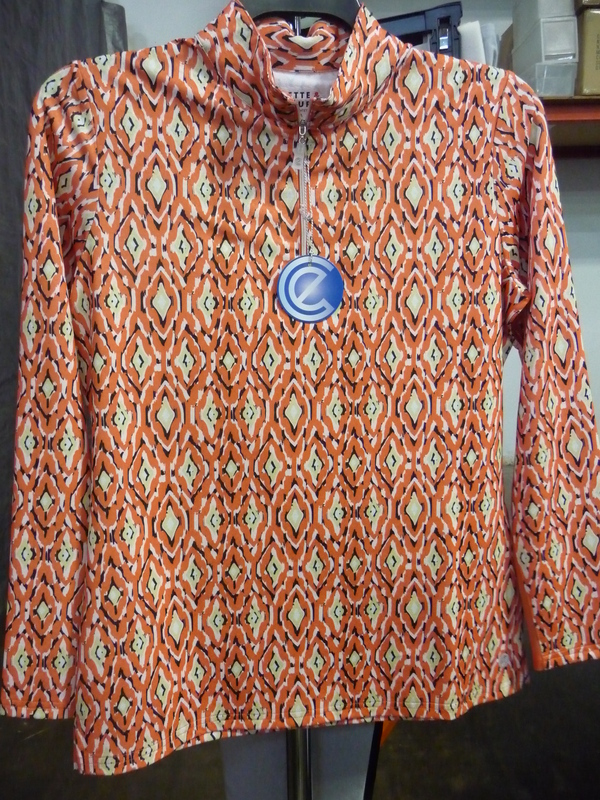 Click images above to see this colorful top in reverse! 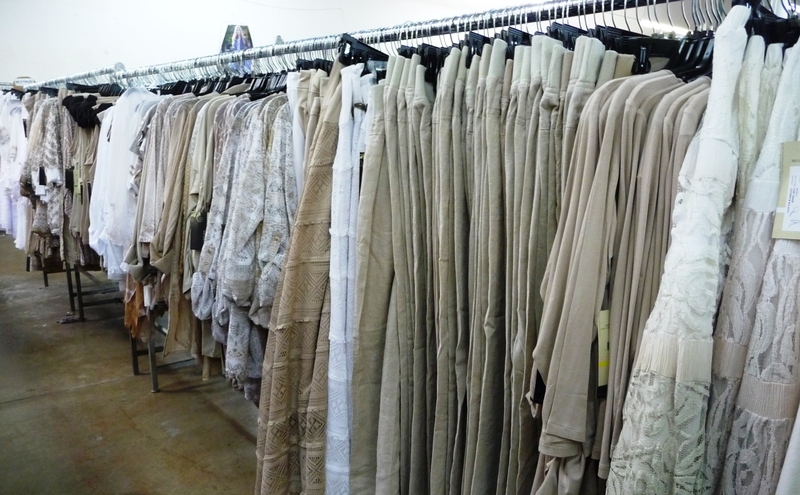 Important to know before going: There is a very large dressing room area provided if you want to try on all your wonderful finds, but typical of women’s fashion warehouse sales, it is ladies only but not private — you likely want to keep this in mind when choosing your undergarments : ). Since this is a women only event, husbands, guy-friends and kiddos under 12, please stay comfortable at home. 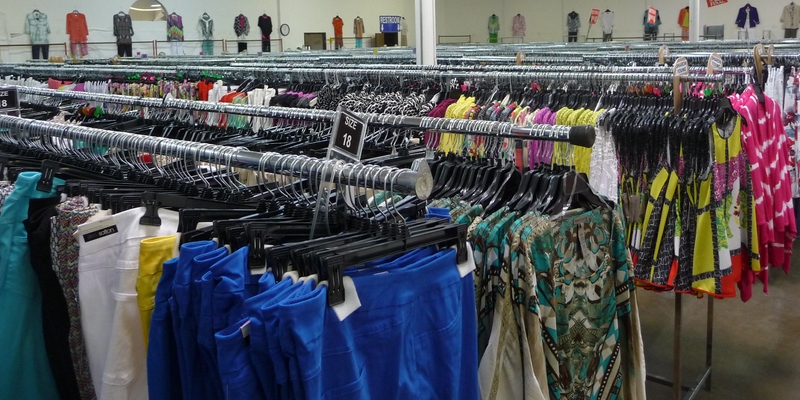 It’s almost here — Our readers’ favorite fashion and warehouse clothing sale, The Ladies Designer Brand Warehouse Sale starts next week and runs for 3 days (doors open Thursday, Feb. 4 to Saturday, Feb. 6 only)! 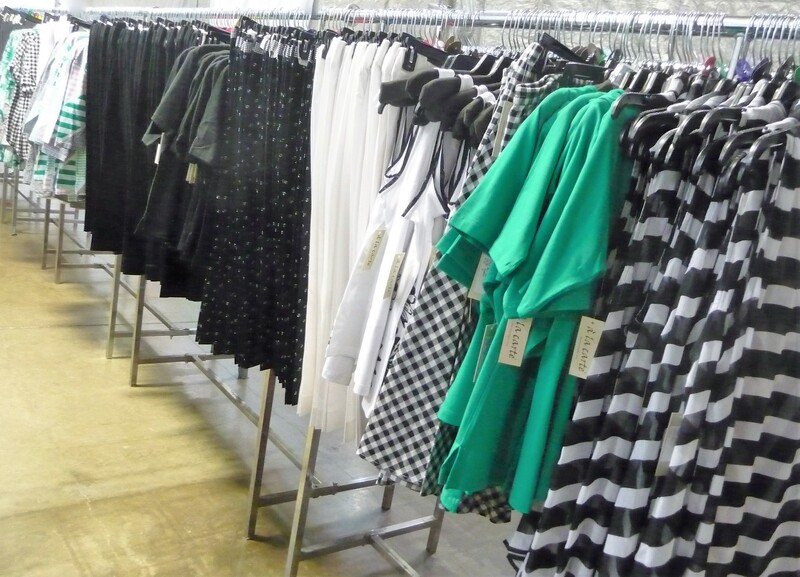 The direct from the designer, Sharon Young & Ladies Designer Brand Warehouse clothing sale only opens the doors to the public four times a year and their next sale runs Thursday to Saturday, February 4-6. This sale is in a large, new venue (behind Sharon Young’s design headquarters in Dallas), and everything will be marked down at least 50% OFF retail! 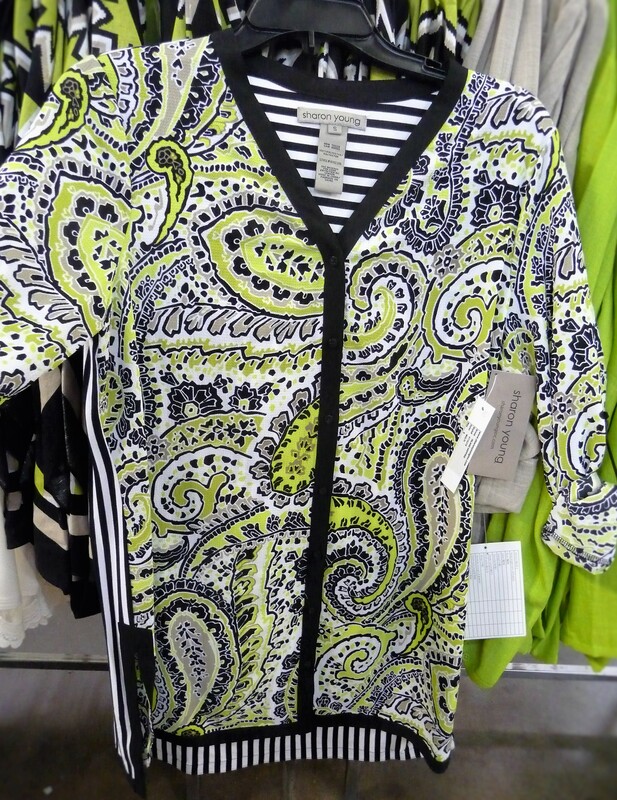 You’ll find sizes and designs to fit just about anyone ~ from petite to women’s sizes and everything in between, plus a variety of styles from casual to night-on-the-town elegant! You don’t want to miss this fantastic sale, including a special Buy One Get One Free offer on Thursday & Friday (Feb 4 & 5)! We will be heading over for a preview of the sale this week to get you an exclusive sneak peek at some of the wonderful finds (get your shopping list ready!). In the mean time, be sure to carve out time to pop over to next week’s sale. Our “readers’ favorite” fashion sale only opens its doors four times a year, and this long-awaited 3-day summer sale starts this week (July 30-Aug. 1)! This sale is huge with over 19,000 pieces starting at $20 with sizes to fit just about anyone ~ from petite to women’s plus sizes and everything in between (sizes 2-18 and a stylish selection of 0X-3X). Once again, we saved a bundle (50 to 75% off regular retail) and went home with some gorgeous clothes usually only found at higher end ladies boutiques and department stores at higher prices. 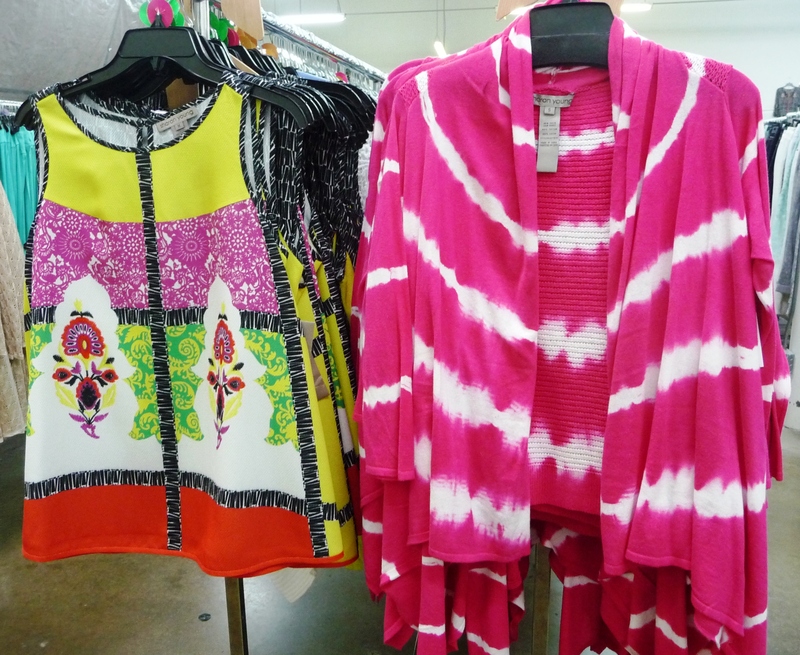 The racks were already packed, and even more beautiful pieces were coming into the warehouse during our visit! The sale covers a huge selection and variety of styles, from trendy to traditional and from “running to the grocery store” casual to night-on-the-town dressy. 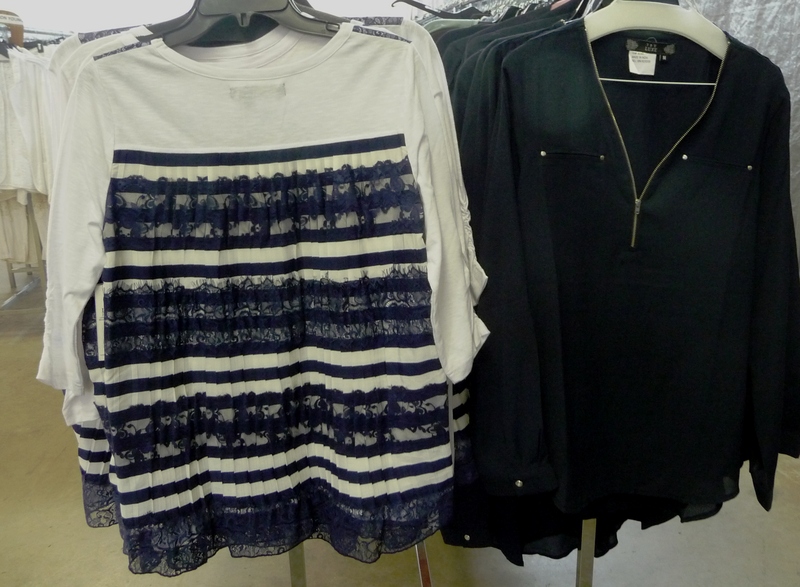 Plus, we found a nice variety of sizes to fit and flatter. 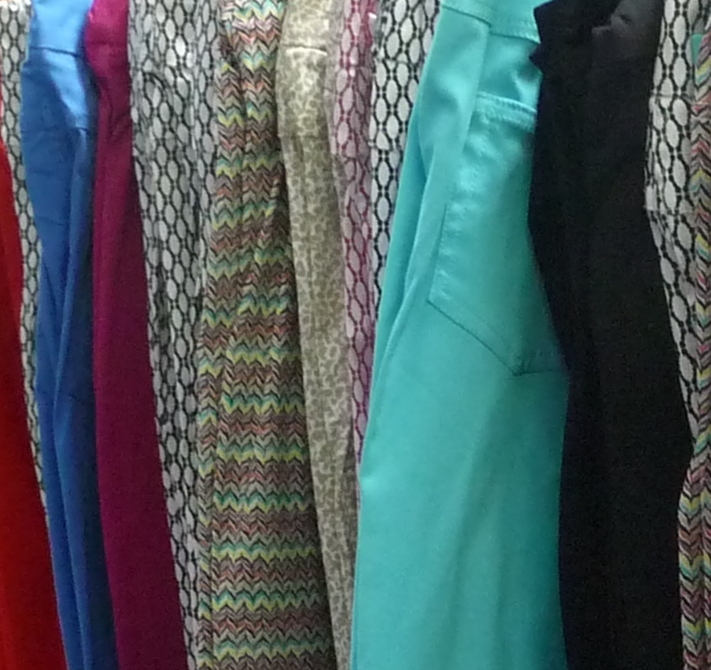 You’ll find everything you need to complete an outfit including tops, skirts, pants, and jackets ~ all $20 to $60. 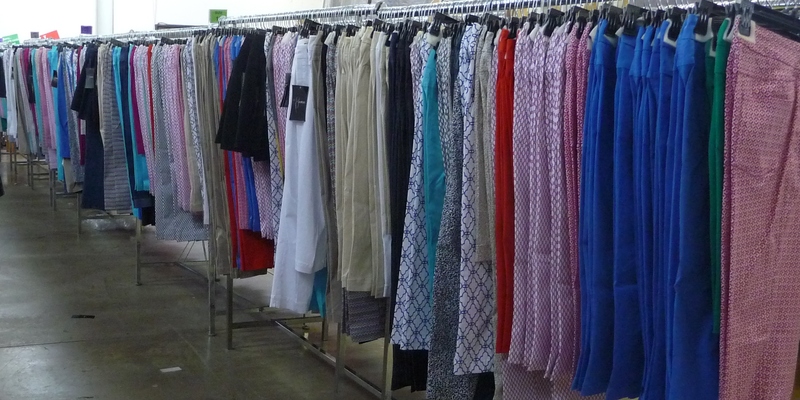 And, even though the sale is huge, everything is very organized into collections, making it easy to navigate the sale. 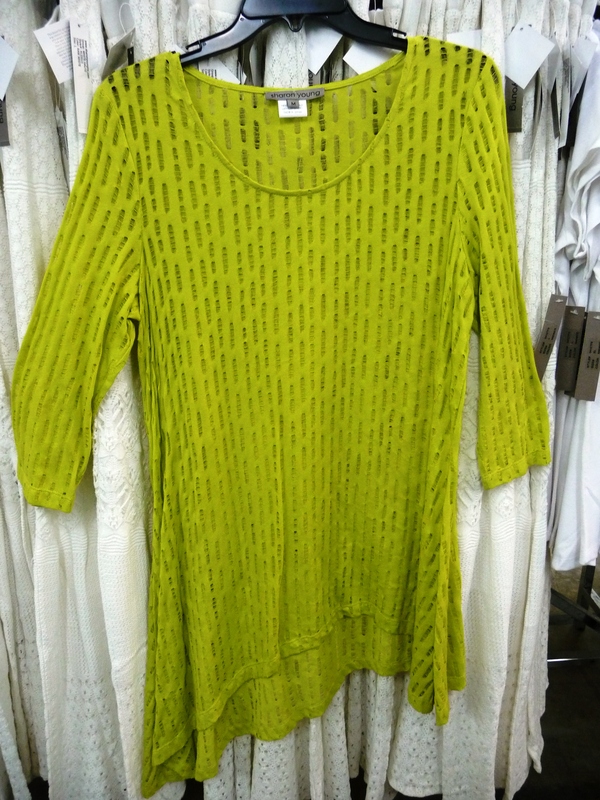 Brands you’ll see include Sharon Young, Multiples, Tru Luxe Jeans, Ali Miles, City Girl, & more. INSIDERS TIP: The sale will feature a special “Buy One Get One FREE” deal on Thursday and Friday (only)! This offer is on top of the already discounted prices, so be sure to ask about this deal to stretch your savings and wardrobe. 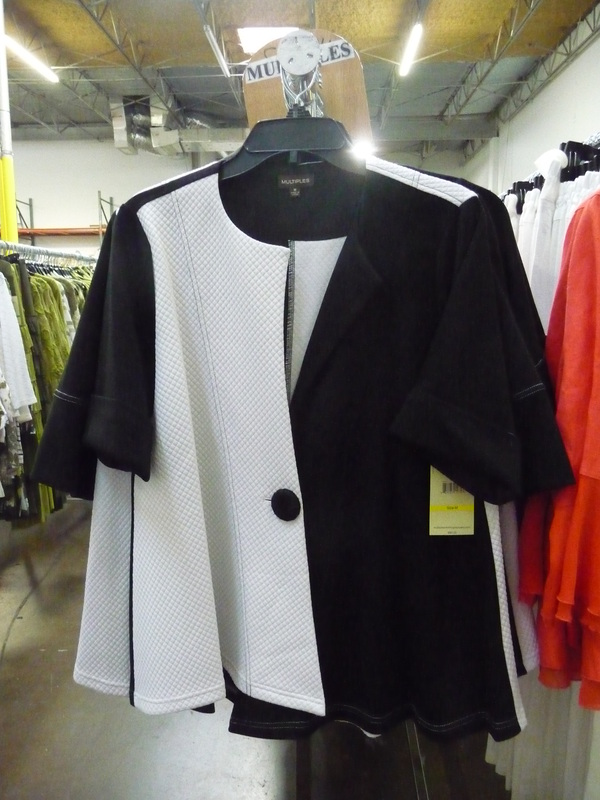 :: We had a great time previewing the warehouse sale for you! I hope you are able to make it over to the sale to check it out yourself and grab some bargains, too.